Manitoba's provincial landscape is dominated by forests. Of the total provincial land area of 63.62 million ha, 36.35 million ha of this is forestlands and other wooded areas - approximately 57% of the land base. Approximately 95% of Manitoba's forests are provincial Crown land, while only ~3% is private land and ~2% is federal land. Within Manitoba's natural regions, forest lands - either mixed wood or boreal forest - are prevalent on the landscape. Forest regions are comprised of approximately 35% productive forest land. Wetlands, rivers, lakes, geological structures, muskeg, significant elevations and slopes, and development infrastructure comprise the other 65% of these natural regions. Larger Version Manitoba's forest natural regions do not yet have completed networks of protected areas. There are many Areas of Special Interest (ASIs) designed by Manitoba Conservation that are currently under review for protected status in Manitoba's forest regions. Manitoba's boreal forest regions are urgently in need of protected areas in advance of development intentions - forestry-related as well other types of development. The last significant decision for establishment of a new protected area that represents a forest natural region was made in 1999. Several decisions for smaller protected areas have occurred since that time. 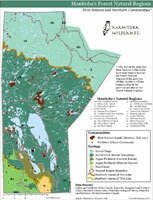 Visit Manitoba Wildlands' protected areas pages for more information. Many of the communities that comprise Manitoba's 1.2 million people are communities that lie within Manitoba's forest lands. There are 62 First Nations in Manitoba, each holding reserve lands in one or several locations. There are also cities and towns (The Pas, Thompson, and others) located in these regions of Manitoba. Also, there are 50 Northern Affairs communities in Manitoba. Many of these are predominantly Métis. The Boreal Forest is Manitoba's largest forest zone, and largest biome, or ecological community. It is also sometimes referred to as the Northern Coniferous forest and covers about one-third of the province, stretching in a broad band across the north central and central part of the province, between the 2 main lakes in the province, and down the east side of Lake Winnipeg and across our eastern border into Ontario. Manitoba's boreal regions are dominated by black spruce in the lowland bogs and fens, and jack pine, poplar and white spruce on the uplands. Trees are not the only important feature in Manitoba's boreal; muskeg (a mat of sphagnum moss), peat bogs, rivers, cold lakes and wetlands are found throughout the landscape. The industrial developments in Manitoba's boreal forest regions include: mining, hydro electric system, forestry operations. Significant areas in Manitoba's boreal regions are not allocated and not impacted by roads or development. Tourism is a significant economic potential for these forest regions also. Visit Manitoba Wildlands' Boreal Forest page for more information on boreal forest ecosystems, species, and the need for conservation and protection of this very special part of our country's landscape. Assessing the impacts of development on the boreal forest in Manitoba is complicated. Impacts are often minimized by assessing only the small area of forest impacted by the development's actual footprint, which can ignore effects that extend well beyond this area. Linear disturbances are events that disrupt the structure of a population, community or ecosystem, change the availability of the resources in the physical environment, and form a more or less straight line pattern in the landscape. Linear disturbances that result from development (they can also be natural) create corridors on the landscape, which are associated with a variety of effects on the boreal ecosystem and boreal species. First and foremost, linear disturbances divide large intact landscapes into smaller patches (fragmentation), and convert forest interior habitat into edge habitat. This results in other effects including species mortality, invasion of non-native species, increased accessibility (humans and predators take best advantage of this), soil erosion, and reduced habitat effectiveness. For some species and habitat types, linear disturbances can be devastating. To illustrate some of the impacts of linear disturbance on the boreal landscape, Manitoba Wildlands examined some of the potential effects of two types of linear disturbances- hydro transmission corridors and roads. Note that these examples are only two of the many types of impacts that can occur. This type of information/assessment of the potential effects of linear disturbances is important and paints a picture of the existing impacts of development. It is also critical for a better understanding of how to assess cumulative effects of new developments in our boreal regions. This exercise also demonstrates the type of information needed, and the type of analysis necessary for due diligence on the part of proponents undertaking environmental assessment of proposed development in our boreal forest regions. The Committee on the Status of Endangered Wildlife in Canada (COSEWIC) and the federal Species At Risk Act list woodland caribou as 'Threatened'. Woodland caribou are a species that has immense requirements for space and requires vast tracts of mature forest. Caribou are impacted by linear disturbances on the landscape in a variety of ways, through direct effects such as habitat loss or direct mortality (in the case of a road), but also through indirect effects such as avoidance (reduced habitat effectiveness). There is still debate in the scientific community as to why caribou avoid linear disturbances, but it is widely acknowledged that they do avoid them - to greater and lesser degrees, depending on such factors as the width of the corridor, level of activity within the corridor, and whether the corridor is temporary or represents a permanent alteration of habitat. Our first chart illustrates the potential effects of woodland caribou avoidance of hydro transmission corridors. Manitoba Wildlands assessed six scenarios involving differing degrees of avoidance and calculated the potential area of boreal forest impacted through caribou avoidance for the total length of existing and potential hydro transmission corridors in Manitoba. We also referenced expert opinion regarding hydro corridors impact on boreal songbirds. Information about potential avoidance of hydro transmission corridors by woodland caribou comes from the scientific literature; Manitoba Wildlands has applied this to data regarding the total length of the hydro transmission corridor system in Manitoba. However, the area impacted includes only the area of avoidance and does not include the actual area of the corridor width, since this varies and is not available. In this respect, the chart underestimates impact zones. We have used woodland caribou as a high profile and at risk species that is impacted by corridors in the boreal. These same corridors are also impacting other species in a similar fashion. These impacts are in relation to range size, size of the species, and ecosystem functions which the species needs, and or aids. Roads are the single most important indicator of the integrity of wilderness areas - they make other human disturbances possible and their cumulative effects persist as long as the roadbed is in place. Roads act as a catalyst, enabling additional impacts on forests and forest species to occur when the road leads to increased economic activity - which is often the case. So, as far as linear disturbances are concerned, roads are a major cause of forest fragmentation. All of the other impacts associated with linear disturbances (discussed above) can be applied to roads in one situation or another. Manitoba Wildlands' second chart illustrates the potential area of boreal forest impacted by the presence of all-weather roads in Manitoba. Once again, six scenarios are presented to reflect the fact that depending on the species or ecosystem type/habitat under consideration, impacts will extend beyond the roadbed itself to greater and lesser extents. Soil type, hydrology, weather, and topography are also factors that influence the extent of road impacts. Two roads scenarios are used; one uses the length of the entire all-weather road system in Manitoba, and the other calculates areas impacted by roads in Manitoba's boreal forest natural regions. Note that winter roads, trails, forestry roads, railroads, pipelines, and internal urban roads are not included in the chart below. In Canada, under the Canadian Constitution, natural resources are under provincial jurisdiction, except in specific circumstances. As such, the Government of Manitoba is primarily responsible for the management and use of forests on Crown (public) lands in the province. 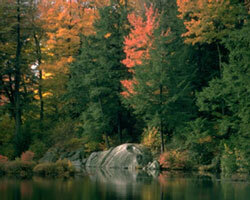 The province makes laws and regulations and sets the policy governing the use, management, and protection of forests. See the section below on Manitoba Government Forest Legislation, Policy and Commitments for more information. 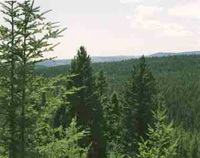 The federal government's direct or shared roles in forests is based on a focus on science and technology, international relations, trade and investment, industrial and regional development, national statistics, climate change, protecting water, Aboriginal affairs, environmental regulations and the management of federal lands. See Manitoba Wildlands' section Canada Forest Policies for more information on the federal government's role in Canada's forests. Sorting out the labyrinth of Manitoba forest legislation, policy, guidelines, commitments can be challenging, as it not necessarily housed in one place. More than one government department has responsibilities related to Manitoba's forests. For instance, the Manitoba Conservation Forestry Branch oversees the allocation of forestry tenure and sets policy regarding such issues as harvesting. The Environmental Approvals Branch is responsible for environmental licensing of forestry licenses. The Protected Areas Initiative is responsible for the consultations regarding protecting forest areas. Industry, Trade and Mining have other responsibilities, as do Aboriginal and Northern Affairs and Manitoba Water Stewardship. Forestry activities within Manitoba are regulated by the provincial Forest Act and by the provincial Environment Act. The Forestry Branch within Manitoba Conservation is responsible for managing forests on provincial Crown land. Other government departments are responsible for regulating mining, hydro development, road building etc in these forest regions. 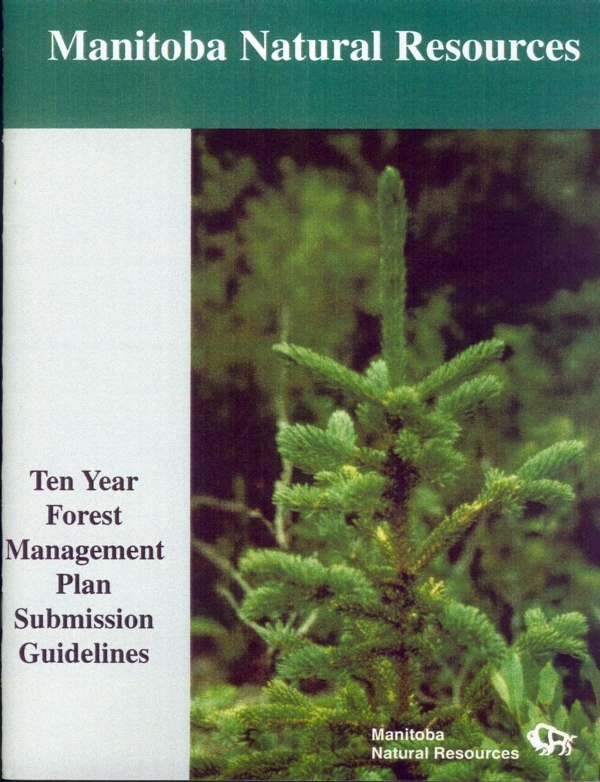 Comparing Manitoba Government 1999 Forest Management Plan (FMP) Submission Guidelines to the 2007 Forest Management Plan Submission Guidelines shows a number of differences that change the tone, perhaps intent, of the 2007 guidelines from the 1999 guidelines. These changes favour the proponent through less specific language and add more proponent discretion. There are also additions that increase the scope of the FMP Submission Guidelines to include community discussion and ensuring species protection. 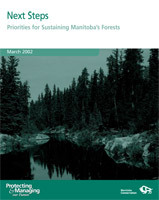 Manitoba Conservation released a forest policy document in March 2002 entitled Next Steps: Priorities for Sustaining Manitoba's Forests (PDF). One of the three main goals for the province's forest regions identified in the policy document is 'protecting our forests'. 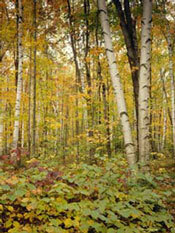 The document contains several other references to the establishment of protected areas in Manitoba's forest regions. 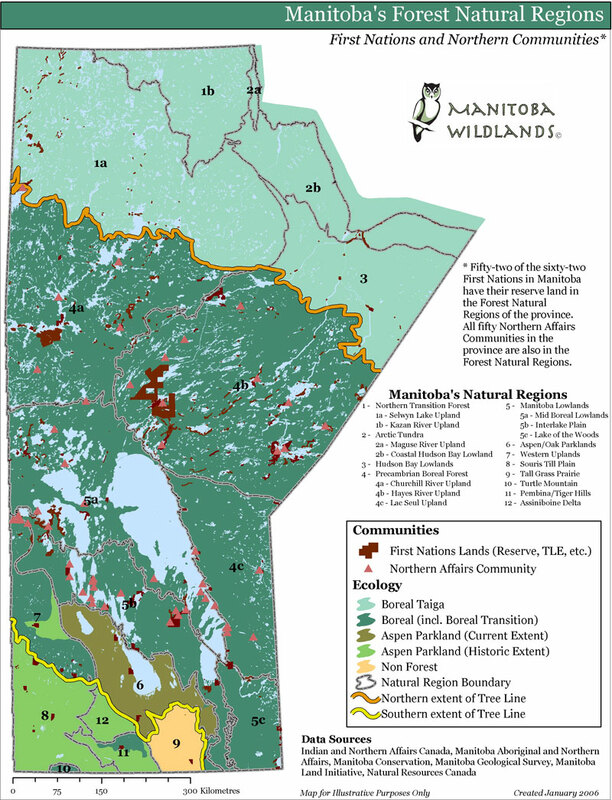 The government of Manitoba has repeatedly endorsed the First Nation-led World Heritage Site (WHS) proposed nomination for an area that encompasses the traditional lands of three Manitoba and one Ontario First Nations, as well two provincial parks/ protected areas that span the provincial border. The Manitoba Conservation Forestry Branch recently began the Forest Practice Initiative (FPI). The FPI provides forest harvesters with 'best practice' guidelines and standards in relation to sustainable forest management through separately released individual guidebooks. The guidebooks are developed in collaboration with industry only. East Side Planning Initiative Commitment (PDF) - Fundamental Principle of "maintain[ing] the ecological integrity and biological functions of the boreal forest within the planning area"
Q3 Will your government complete outstanding protected areas establishment in our forest regions? Provide time table please. Q4 Will your government ensure that protected areas networks are completed in forestry license areas? Q5 Will you make protected areas establishment a condition of forestry licenses? Q10 When will your government designate the first protected areas inside the Tolko forest management license area? Which areas?